The Common Technology Services (CTS) team at GDS works to help government departments use cheaper cloud-based solutions and shared technology components. We’re delivering projects like GovWifi - a single wifi login that can be used across government. As user researchers on CTS, we help our team understand the day-to-day lives of our end users - civil servants working across government. 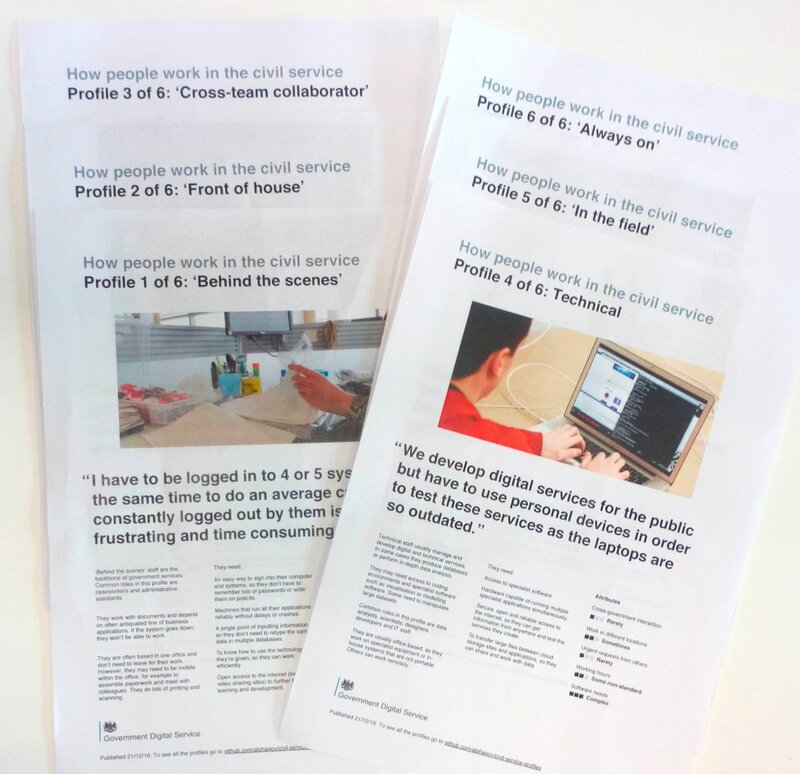 To pull together what we’ve learned about how civil servants work, we’ve developed a set of cross-government user profiles. Here’s how we created them and how they can help you. These profiles were created by interviewing civil servant across government and by working with departments to incorporate findings from their own research. We also reviewed existing user profiles, such as these ones developed at the Home Office. Combining our interviews and the work done by other departments gave us a good understanding of civil servants’ common needs. We also identified the key attributes and behaviours that differ depending on the role someone is in. These include the amount of cross-government interaction, working in different locations, frequency of urgent requests from others, type of working hours, and the need for bespoke software. This allowed us to create 6 profiles that each describe a different government job role, how they work, and their needs from workplace services. We shared this new set of profiles with other teams working in department transformation, gathered feedback on how they used them, and iterated and refined them. The profiles are available in Github. So far, the cross-government profiles have been used by teams building cross-government services, working on cross-government training, planning Smarter Working, and making estates changes. In our team, we’ve found the profiles are a valuable reference point for people designing, delivering or choosing something for a department, or for all of government. They also help us include all the people we need to in our user research. When we’re working across departments the profiles give us a great starting point for a common understanding of internal users. We’ve found that the profiles are representative of staff in all departments we have worked with - but we know there will always be local differences. So we recommend that departments use the profiles as a head-start in understanding their staff, then do their own user research to identify specific needs and pain points. If you would like to join a cross government community of people who are developing and using the profiles for their projects, we’d love to hear from you. Send an email titled “Join the civil service profiles community” to contact.cts@digital.cabinet-office.gov.uk. Hi, I'm the Head of the Smarter Working Programme, Productivity Benefits Realisation team within the Home Office, we started by using the initial 7 user types but as we delved deeper into the way people worked, we found that our diverse workforce actually were being divided across 2 or more of the 7 user types in operational areas of the business. We did some further work to try and simplify how we categorised our workforce based on their role and the type of device they would require. - Mobile Operational: MOs undertake a core proportion of their job away from an office or fixed location. They move between different sites to undertake their role. These may be large operational sites such as ports, freight areas, factories or may be buildings with desk space such as police stations, courts or detention centres. MO’s need to access their information and systems whilst they are on the go to make real time decisions, to capture evidence and to capture notes. MO’s may have a regular office base which they will return to, where they may undertake more detailed work or reports at a desktop or laptop. - Mobile Office Based: MOBs predominantly work in an office environment but are mobile within that environment. They often work from different offices, may work from home or other flexible locations. They regularly move around the office to meetings or breakout areas and are likely to undertake business travel. They require flexible IT that enables them to access information, applications and emails from anywhere, with remote Wi-Fi access through a smartphone. - Static: Static users typically work from one Home Office site though they may move around within it, at the same desk or hot-desking to perform their duties. Some work/roles are shift based, rotating 24/7 and often customer facing or at the back office processing data or real time information recording. Staff spend much of their time working from business applications, needing extensive access and inputting of data into key business applications. Extensive public contact and liaison with other government departments may also be an extensive part of their role. The above allowed us to quickly categorise the users in way that was more in sync with operational and non-operational roles and ways of working.